It is a DC-DC Converter Buck Module, voltage range 8-35V to 5V, low power consumption, no-load consu.. It is a 18W Power Supply Module/Auto Buck Boost Converter/Adapter, Input voltage: DC 3~35V, Output v.. It is a 120W Power Supply Module/Car Converter/Adapter, Input Voltage: DC 36V(wide range 24V~60V), O.. 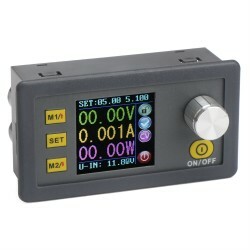 It is a DC Stepdown Module, With voltage Current Display, voltage range 4.5-24V to 0.93-20V, output.. The DC 4.5-24V to 1-20V Buck Module, it Band voltmeter ammeter display, 2A Output Current Continuou.. This is a non-isolated step-down module, input voltage 5.5~32V, adjustable output voltage :1~27V, th.. It's a DC Buck Module,Input voltage: 5V-32V,Output voltage: 0.8V-30V,Conversion efficiency: 95% (max.. It is 30WAdjustable Power Supply Module +Voltage Current Monitor, Input voltage range: DC 5~32V (not.. It is a DC Buck Converter,Input voltage :DC 5-36V,Output voltage :1.25-32V,Output Current : 5A MAX( .. It is a DC 5~36V to 1.25~32V 5A 75W Constant Voltage Constant Current Power Adapter/Adjustable Volta.. It's a DC Step-down Power Converter,Input voltage : 7-32V,Output voltage :0.8-28V,Constant current r..
Small mini, Long Cable 3 meters. regardless the hot Temperature in summer. build-in fuse. the great .. It is a adjustable voltage regulated power supply. Voltage Range 5-40V to 1.25-36V Adjustable DC Ste.. It is a Portable Cable/USB Converter/Charger/Adapte/Driver, Input Voltage: 5V, Output Voltage: 9V / .. It is a 2in1 Car Charger/Clock , Input voltage: DC 12V, Output voltage: DC 5V, Applications:used to..